name 5 things. : Chevron Boards - Round 2. After reading all of your helpful comments, I really considered leaving them the way they were. I figured once they had pictures, notes, etc. on them, you wouldn't notice as much. But at the end of the day, I really wanted a little more color. 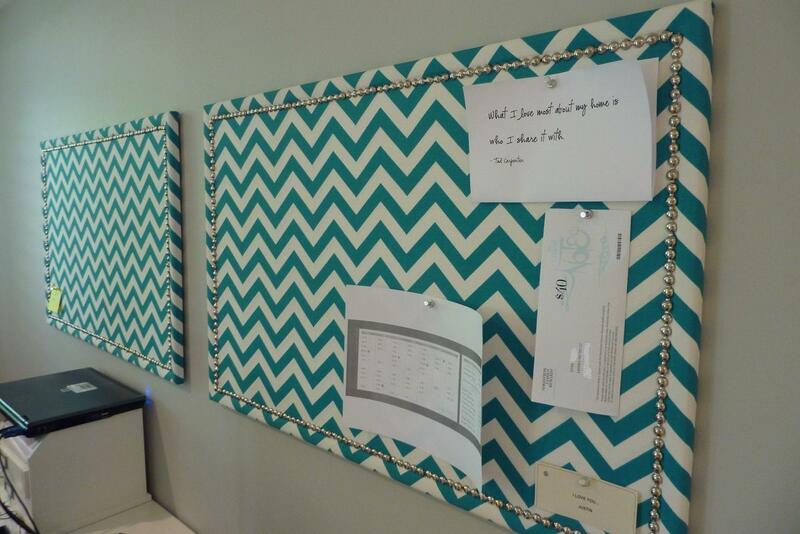 I loved the look of the chevron, so when I saw the turquoise chevron at High Fashion Home, I knew it was the winner. It's a Premier Fabric Print, but I don't see the fabric in this color online. Because I used spray adhesive to attach the first fabric to the cork board, I knew that if I tried to remove the fabric, it would pull up the cork with it. So I just put the new fabric right on top. If you look closely, you can barely make out the fabric underneath, but it is almost completely unnoticeable. Clearly both Justin and I need some more inspiration on our boards! But don't worry, I actually completed these a while back, and they are looking more filled (and inspirational) at this point. I am much happier with the new fabric! And ultimately am glad I made the relatively easy change. The office is really coming along. I can't wait to show you how the rest of the room is coming together. Happy Monday! I saw this fabric the other day and started thinking of where I could put it in my house. I love the color! The boards look really good, especially with the trim. love it! The color is great!! Love the new boards Emily! Great pop of color!! You are so right... that pop of color is fantastic. Good call! LOVE it!!!! And WHERE did you get the gray rug? Its beautiful! HI friend!!! They look fantastic. I love the color. What a difference. I love that color with the bright white desk and chair. Hope you are doing great. Very pretty. I love the change. I bet it makes sitting down at your desk so much nicer! i love the change!! i can tell the office is going to look gorgeous. can't wait to see the entire room! Oh my gosh! I am in love! Did you put the fabric right over a framed bulletin board? These look great. I love the contrast with the soft color on the walls. I love both of them!!! The nail detail takes it to the next level. Love it!!! I love the turquoise chevron... much better then the grey! I am looking to do the same sort of project for my kitchen! Very pretty! I like the change. The colors just pops against those walls. ooh! So pretty! I love the bright fabric against the subtle gray of the walls. Looks great! Love the bold punch of color! Hope you had a wonderful weekend! I LOVE those. When I saw the first photo I thought it looked great but when I scrolled down I see what a huge difference it makes to have the turquoise. Good for you for putting in the extra work to make it perfect. Love your boards. I agree after seeing the new boards they are much more of a statement, they look great in the room! Those look amazing! I love the turquoise fabric choice. Your office looks gorgeous! LOVE. Clearly I heart the chevron pattern (: The color is awesome, too! this looks awesome! it matches your blog too! Wow what a great job.Can not wait to see the rest of the office. I loved the first board you did, but this aqua color really pops. Great job! And I can't wait to see where you put your new art- it looks like a pretty good sized piece! I only discovered this colorway recently. It's perfect in the room! Did you have 2 before? What did you use for the metal pegs around the board? Just thumb tacks?